Bloomberg Technology video published Feb 28, 2018: Bloomberg's Cory Johnson discusses Salesforce's earnings on "Bloomberg Technology." Salesforce.com (NYSE:CRM) Q4 EPS of $0.35 beats by $0.01. Revenue of $2.85B (+24.5% Y/Y) beats by $40M--more at SeekingAlpha.com. 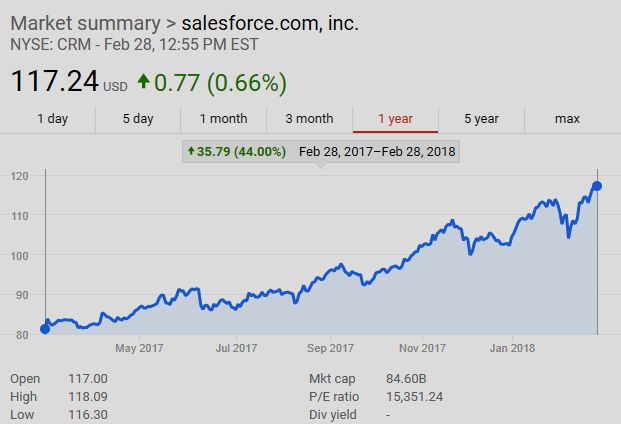 Salesforce.com Reports Earnings On Wednesday Above The Cloud With An Elevated P/E Ratio - Salesforce.com, Inc. (NYSE:CRM) | SeekingAlpha.com: "Fundamentally, the P/E ratio is elevated with the 2017 actual of 434.62 according to Nasdaq.com. Technically, Salesforce is a pure momentum stock. It’s above a ‘golden cross’ on its daily chart and is overbought on its weekly chart." Digital Transformation Drives Future Revenue Growth: The Isobar Digital Strength Index - Salesforce Blog | salesforce.com: "In short, companies that invest more in digital transformation actually outperform their peers over time. Those companies are more prepared for disruption, better able to monetize new digital channels, and build a bigger user base. This phenomenon exists regardless of industry. Interestingly, it tends to be somewhat stronger in laggard industries." 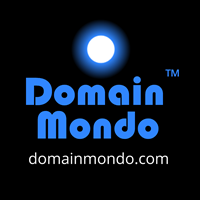 See also on Domain Mondo: News Review | ICANN WHOIS & EU GDPR: Points of View (Salesforce video). Salesforce video above published Aug 14, 2017: This is a simple definition of CRM: Customer relationship management (CRM) is a technology for managing all your company’s relationships and interactions with customers and potential customers. The goal is simple: Improve business relationships. A CRM system helps companies stay connected to customers, streamline processes, and improve profitability. Federal Reserve Chairman Jerome Powell will testify before the House Financial Services Committee on Tuesday, February 27 at 10:00 a.m. ET to deliver the Federal Reserve’s semi-annual Monetary Policy Report to Congress and to discuss the state of the economy. "Monetary Policy and the State of the Economy"
Hearing entitled “Monetary Policy and the State of the Economy” | House Committee on Financial Services: Tuesday, February 27, 2018 10:00 am ET in 2128 Rayburn HOB (Full Committee)--Witness List: The Honorable Jerome H. Powell, Chairman, Board of Governors of the Federal Reserve System. On Thursday March 1, 2018, 10:00 a.m. ET Fed Chair Powell testifies before Senate Banking Committee--The Semiannual Monetary Policy Report to the Congress - Hearings - U.S. Senate Committee on Banking, Housing, and Urban Affairs: "March 1, 2018 10:00 AM 538 Dirksen Senate Office Building, hearing on “The Semiannual Monetary Policy Report to the Congress.” The witness will be: The Honorable Jerome H. Powell, Chairman, Board of Governors of the Federal Reserve System." Markets watching Fed chair Powell as he testifies in Congress | cnbc.com: "Fed chair Jerome Powell makes his first major appearance Tuesday and Thursday, when he testifies on the economy before congressional committees." The Internet & Jurisdiction Policy Network addresses the tension between the cross-border nature of the internet and national jurisdictions. Its Paris-based Secretariat facilitates a global multistakeholder process to enable transnational cooperation. Participants in the Policy Network work together to preserve the cross-border nature of the Internet, protect human rights, fight abuses, and enable the global digital economy. Global Internet And Jurisdiction Conference 2018 | conference.internetjurisdiction.net: Feb 26-28, 2018, Ottawa, Canada. How can transnational data flows and the protection of privacy be reconciled with lawful access requirements to address crime? How can the neutrality of the internet’s technical layer be preserved when national laws are applied to the Domain Name System?" The 2nd Global Internet and Jurisdiction Conference of the Internet & Jurisdiction Policy Network will be an important milestone in addressing one of the greatest global governance challenges of the 21st century: how to manage the coexistence of national laws on the internet. When they convene in Ottawa, Canada, on February 26-28, 2018, key senior-level representatives from a wide range of stakeholder groups and countries will work toward the development of policy standards and operational solutions to at the same time fight abuses, protect human rights, and enable the global digital economy. This is necessary to preserve the benefits generated by the cross-border nature of the Internet for future generations. The 2nd Global Conference of the Internet & Jurisdiction Policy Network is organized in partnership with the Government of Canada and institutionally supported by the OECD, UNESCO, the Council of Europe, the European Commission, and ICANN. Taking stock of the outcomes of the 1st Global Conference in 2016 in Paris, and the intersessional work in the Policy Network’s three Programs Data & Jurisdiction, Content & Jurisdiction, and Domains & Jurisdiction, the 2nd Global Conference of the Internet & Jurisdiction Policy Network will be an important opportunity. Stakeholders will decide on concrete focus and priorities, as well as a clear methodology and roadmap for the Policy Network to advance the development of policy standards and operational solutions for submission at the its third Global Conference. It will take place in Berlin in June 2019, and will be, after France (2016) and Canada (2018), organized in partnership with Germany. Time has come to accelerate the collective effort to address growing jurisdictional tensions on the internet through joint action. Mobile World Congress | mobileworldcongress.com: Mobile World Congress is the world’s largest gathering for the mobile industry, organised by the GSMA and held in the Mobile World Capital, Barcelona, 26 February – 1 March 2018, Agenda and Sitemap. Domain Mondo's weekly internet domain news review (NR 2018-02-25) with analysis and opinion: Features • 1) ICANN WHOIS & EU GDPR: Points of View (video), 2) Morgan Stanley Technology, Media & Telecom Conference - GoDaddy $GDDY, 3) ICYMI Internet Domain News: China, George Soros, and Turkey, 4) ICANN news: SSR2-RT: Letter from GNSO Council to SO/AC Leaders, and more, 5) Names, Domains & Trademarks, 6) Most Read. Salesforce.com, Inc. video above published Nov 10, 2017. "Learn about the General Data Protection Regulation (GDPR) ... the new EU regulation." Salesforce.com, Inc. (NYSE: CRM), is a cloud computing company headquartered in San Francisco, California. Editor's note: notice the completely different angle of approach taken by Salesforce as compared to ICANN (see below). Salesforce, an American technology company operating globally, has fully embraced the EU's GDPR as consistent with Salesforce's own core values ("trust"), is clearly prepared, confident, and proactive in educating and preparing its own stakeholders (customers) for the GDPR effective date of May 25, 2018 (now less than 90 days away). ICANN, on the other hand, as of today, is still clearly unprepared--Letter from ICANN CEO Göran Marby to Chair, Governmental Advisory Committee (GAC), Manal Ismail | ICANN.org Feb 22, 2018: "As I noted in the 2 February webinar, we are seeking a single model for both the contracted parties and ICANN org to follow." --and has yet to publish its "single model" for use by ICANN and its "contracted parties" (registrars and registry operators). On Thursday, Feb 22, 2018, I asked ICANN CEO Goran Marby (who is a citizen of Sweden and the EU): "1) When did you first become aware of the ramifications of the EU GDPR for ICANN, and 2) what caused ICANN to be so late in preparing for the May 25, 2018 effective date?" Sun on Privacy: 'Get Over It' | WIRED.com Jan 26, 1999: "The Chief Executive Officer (CEO) of Sun Microsystems said Monday that consumer privacy issues are a "red herring." "You have zero privacy anyway," Scott McNealy told a group of reporters and analysts Monday night at an event to launch his company's new Jini technology. "Get over it."" About WHOIS | ICANN.org: "Every year, millions of individuals, businesses, organizations and governments register domain names. Each one must provide identifying and contact information which may include: name, address, email, phone number, and administrative and technical contacts. This information is often referred to as "WHOIS data." But the WHOIS service is not a single, centrally-operated database. Instead, the data is managed by independent entities known as "registrars" and "registries." Any entity that wants to become a registrar must earn ICANN accreditation. Similarly, registries are under contract with ICANN to operate a generic top level domain, such as .COM, .ORG, or one of the new gTLDs such as .STORAGE and .LINK. "Based on existing consensus policies and contracts, ICANN is committed to implementing measures to maintain timely, unrestricted and public access to accurate and complete WHOIS information, subject to applicable laws. To do that, registrars and registries provide public access to data on registered domain names. Anyone can use the WHOIS protocol to search their databases and identify the domain name registrant. "In 2016, new ICANN Bylaws replaced the WHOIS obligations originally established by the expired Affirmation of Commitments. These Bylaws require periodic reviews to assess the effectiveness of the current gTLD Registration Directory Service (RDS, formerly known as WHOIS) and whether its implementation meets the legitimate needs of law enforcement, promoting consumer trust and safeguarding registrant data. In addition, those Bylaws require ICANN organization to use commercially reasonable efforts to enforce its policies relating to RDS, while exploring structural changes to improve accuracy and access to generic top-level domain registration data, as well as considering safeguards for protecting such data." GDPR Resources: .... | eNom.com: "ICANN came back with three suggested models, each of which has significant flaws .... but we are proceeding with our GDPR implementation work as planned, relying on our legal counsel to help find the balance between compliance with ICANN and the GDPR itself." Explaining the GDPR to an American | iapp.org: "... when customers share their data with us it is not ours, but rather theirs, at least as the European Union sees it and as reflected in the GDPR ..."
European Commission pitches in on ICANN's proposals for making the WhoIs register GDPR-compliant | Lexology.com: ".... ICANN has not much time left to solve the privacy issues of the WHOIS system, as the GDPR is set to become applicable in the EU on 25 May 2018. Whatever ICANN comes up with: As the Commission notes, it will be for the Member States data protection authorities and ultimately for the courts at national and EU level to assess the compliance of ICANN's new rules with the GDPR." Editor's note: a little more than a year after completion of the IANA transition in which ICANN escaped from direct oversight by the U.S. government, the organization is now confronted with the task of complying with the European Union's GDPR (General Data Protection Regulation) by May 25, 2018, or facing substantial penalties. As noted by Rstreet.org above, neither the internet, nor ICANN, is beyond the reach of governments, the "IANA transition" notwithstanding. Yes, the U.S. government no longer has direct oversight of ICANN (via a contract with NTIA), but the reality is that since ICANN is no longer a U.S. government contractor, it is (or should be) viewed as an independent organization exercising the powers of a global monopoly in its policy-making and granting of global monopoly franchises of generic top-level domains (gTLDs), e.g., .COM and .NET, to enterprises such as Verisign (NASDAQ: VRSN). Under ICANN's multi-level scheme of "privatized" global internet governance, ICANN unilaterally imposes its "taxes" (a/k/a 'fees' or 'the vig') at every level: upon 1) domain name registrants, 2) registrars, and 3) registry operators. Not a bad racket, if you can get away with it, which may also explain why ICANN's compensation and benefits packages are "sky high," and in at least one case, kept secret, an apparent violation of U.S. public disclosure laws applicable to tax-exempt 501(c)(3) non-profit organizations like ICANN. "I think if we get rid of that [IANA] contract we will be free of the pressures." GoDaddy (NYSE:GDDY) is presenting at the conference at 1:15 PM PT Monday. GoDaddy reported Q4 FY2017 results on Thursday, Feb 22, 2018, after the market closed. On Friday, $GDDY shares gained more than 10% (chart above). 10:30 AM PT Square, Inc.
Miss a presentation? They are also available afterwards “on demand” at the first link above. d. ICANN Webinar: Replenishment Strategy for the Reserve Fund | ICANN.org: Webinar Date & Time: 1 March 2018, 17:00 – 18:00 UTC, via Adobe Connect. ICANN Draft FY19 Operating Plan and Budget and Five-Year Operating Plan Update--Close Date 8 Mar 2018 23:59 UTC. Proposal for Korean Root Zone‬ Label Generation Rules--Close Date 17 Mar 2018 23:59 UTC. c. International SEO and search trends: How does it all work? | searchengineland.com: "The main takeaway here is that you must ensure you have the correct domain for your international SEO requirements." c. New gTLDs: Christa Taylor talks [new gTLD] domains | DomainNameWire.com: interview by Andrew Allemann, editor of Domain Name Wire, of Christa Taylor of dotTBA.com, a new gTLDs consultancy. Ms. Taylor honestly acknowledges the disappointing numbers in new gTLD registrations, the faulty expectations ("if we build it, they will come") and projections, doesn't deny that mistakes were made by new gTLD applicants and ICANN, confirms through her own personal experience, the "Universal Acceptance" problems with new gTLDs [Editor's note: better get a .COM domain for an email address], and describes the challenges of IDNs from working with a client registry operator in the Middle East. Tech Review (TR 2018-02-24)--Domain Mondo's weekly review of tech news with commentary, analysis and opinion: Features • 1) Big Tech vs Competition, Innovation, Opportunity? 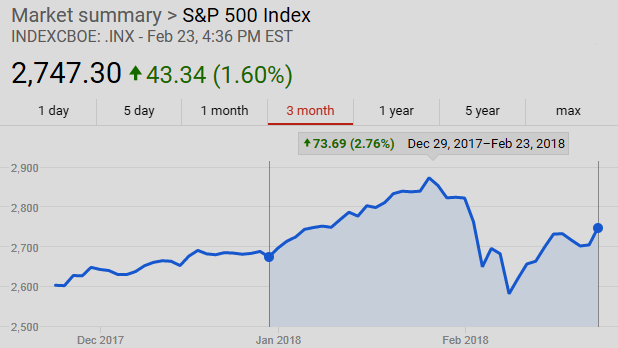 (video), 2) Peter Thiel vs Silicon Valley's Suffocating Group Think (video), 3) Investing: This Week, Investing Notes, 4) ICYMI. Markets Are No Longer Competitive says Scott Galloway: Scott Galloway, NYU Stern professor, and Roger McNamee, Elevation Partners (domain: elevation.com) co-founder, discuss the need to break up big tech to create more innovation and opportunity in the market. CNBC.com video above published Feb 15, 2018. See also The Case Against Google | The New York Times | nytimes.com: Foundem's case against Google exposes flawed arguments of a self-correcting internet economy and why antitrust laws are essential for tech growth. CNBC.com video published Feb 21, 2018: Charles Duhigg, New York Times Magazine, discusses his article about concern over Google allegedly halting other innovation. Why Peter Thiel Is Backing Away From Silicon Valley: Bloomberg's Ellen Huet and Mark Milian discuss why Peter Thiel is relocating his home and personal investment firms to Los Angeles. They speak on "Bloomberg Technology" on Feb 15, 2018. See also: Like Peter Thiel, Tech Workers Feel Alienated by Silicon Valley ‘Echo Chamber’ | WSJ.com. : "... Several tech workers and entrepreneurs also have said they left or plan to leave the San Francisco Bay Area because they feel people there are resistant to different social values and political ideologies. Groupthink and homogeneity are making it a worse place to live and work, these workers said ..."
Fiscal Stimulus: The Cost of Acceleration To Reach "Escape Velocity" from the Fed's historically unprecedented 9 years of QE & ZIRP--US Treasury Posts Gigantic $1.16 Trillion Shortfall in Fiscal 2017, Hilariously Points out “Where We Are Headed” | WolfStreet.com. Too many stock-market pundits are wrongly freaking out about inflation | MarketWatch.com: "Inflation may pick up a bit, but it won’t be for a while and it won’t be as bad as doom and gloomers expect. Investors should stop acting as if this is the end of the world." BlackRock Says Buy U.S. Stocks as Tax Plan Supercharges Earnings | Bloomberg.com: "world’s largest money manager says impending fiscal stimulus will boost already strong momentum for earnings growth." Deficits? $1.2 Trillion Asset Manager: Forget Volatility, The Real Financial Timebomb Is Public Pensions | Zero Hedge.com: "the question is what happens when the music stops, liquidity dries up, and economic contraction besets (or catch up to) the markets?" --Editor's note: Answer--That's easy, just ask The Donald--"The Art of the Deal." EU: Don't Be Complacent About Italy's Elections | Bloomberg.com: "The country's public debt is a threat to global financial stability ... the European Central Bank's policy of quantitative easing [QE] has helped mask Italy's fragility. But the ECB is likely to stop buying new bonds in the fall. When that happens, Italy's deep-seated problems will return to the fore ..." Editor's note: 4 March 2018 is the date of the Italian general election. But is the Eurozone in a QE Trap? Reuters poll: ECB rate rise? You have a very long wait, say economists. Too Big To Fail? RBS Forgery Scandal Metastasizes Days before Crucial Earnings Report | WolfStreet.com: "bailed-out megabank hasn’t had a year in the black since 2007." Walmart [NYSE:WMT] posts worst day since January 1988 | cnbc.com Feb 20, 2018: shares of Walmart shed 10.2 percent. [Editor's note: In 2017, Walmart U.S. eCommerce sales rose 44% and same-store sales increased 2.1% vs. 2016's 1.4% growth rate. But those results and the 2018 forecast fell short of estimates. Oh well, progress not perfection.] See Walmart sets full-year profit guidance below expectations | SeekingAlpha.com. "Your margin is my opportunity"--Jeff Bezos. Amazon’s Latest Ambition: To Be a Major Hospital Supplier | WSJ.com: Amazon is expanding its business-to-business marketplace, Amazon Business, into the medical supply industry, plotting to become major supplier to US hospitals. Jeff Bezos: "Your margin is my opportunity." Google Assistant multilingual support for English, French, and German and will be available in 30+ languages including Hindi and Thai this year--9to5Google.com. Tesla Model S outsells German luxury flagships in Europe | europe.autonews.com. Tesla Semi Trucks: the difference between the purchase price of a Tesla Semi and a traditional diesel truck could be paid off in less than two years due to savings on maintenance and fuel, says DHL executive which has ordered 10 of the Tesla Semi trucks scheduled to roll out in 2019. With $9 billion stake, China's Li Shufu, Chairman and principal owner of Geely in China, is now the largest shareholder (10%) of Germany's Daimler AG (DAIGn.DE), manufacturer of Mercedes Benz cars, trucks and vans. Chinese car manufactuer Geely owns Volvo cars and the maker of London’s black cabs. Next largest Daimler shareholder is Kuwait Investment Authority (7%). Why the iPhone Is Losing Out to Chinese Devices in Asia | WSJ.com: Apple’s market share is stagnant or declining in Asia. AT&T will launch mobile 5G in Atlanta, Dallas and Waco in 2018--engadget.com. See also SeekingAlpha.com. Another reason to get a nice Chromebook and dump Microsoft--Running Windows 10? Here's how Microsoft plans to milk more profits out of its cash cow | ZDNet.com: "PC sales are down. Windows licensing revenue is flat. In its financial disclosures, Microsoft says it's actively looking for new monetization opportunities." Google I/O 2018: May 8-10, 2018, Shoreline Amphitheatre, Mountain View, CA--apply to purchase a ticket by 2/27 5pm PST. Uber Express Pool offers the cheapest fares yet in exchange for a little walking | TheVerge.com: Uber launches Express Pool, which gives cheaper fares to those willing to walk to shared rides, in SF, DC, LA, Miami, Philadelphia, San Diego, Denver, Boston. Richard Branson's Virgin Voyages to create hundreds of jobs in Plantation, Florida | South Florida Business Journal | bizjournals.com: "Virgin Voyages' first ship is expected to sail in 2020 from PortMiami with 2,700 passengers and 1,150 crew members. It will be one of the few cruise lines for adults only." After Florida School Shooting, Russian ‘Bot’ Army Pounced | The New York Times | nytimes.com: "One hour after news broke about the Florida school shooting, hundreds of suspected Russian-linked Twitter bots released divisive posts on the gun control debate." Fake News CNN & MSNBC: Flashback: CNN and MSNBC Helped Russia Sow Discord by Promoting Fake Anti-Trump Rally: "A check of their November 12  coverage showed both CNN and MSNBC gave enthusiastic coverage to the Russian-organized anti-Trump rally that day, with live reports every hour. Correspondents celebrated the idea that it was “a love rally,” and repeated the marchers’ anti-Trump mantras, such as: “We reject the President-elect.”"
L2inc.com video above published Feb 22, 2018: "Pass Go, collect $200, and go bankrupt as big tech buys all the properties"--Scott Galloway. (3:11) “The U.S. Listings Gap,” Credit Suisse, U.S. Global Investors. GoDaddy Inc. (NYSE: GDDY), the world's largest domain name registrar, financial results release for the fourth quarter and fiscal year 2017, on Thursday, February 22, 2018, after the stock market closes. GoDaddy management will host a conference call and LIVE webcast at 5:00 p.m. ET, Feb 22. To hear the call via phone, dial (866) 393-4306 in the United States or (734) 385-2616 from international locations, with passcode 7396408. The live webcast of the call and recorded replay will also be available on GoDaddy's investor relations website at https://investors.godaddy.net. Total revenue of $602.2 million, up 23.9% year over year. Total bookings of $657.9 million, up 25.4% year over year. Net cash provided by operating activities of $104.3 million, up 17.1% year over year. Unlevered free cash flow of $109.2 million, up 42.6% year over year. Customers of 17.3 million at December 31, 2017, up 17.6% year over year. Average revenue per user (ARPU) of $139, up 7.4% year over year. Domains revenue of $281.6 million, up 16.1% year over year. Hosting and Presence revenue of $228.8 million, up 29.5% year over year. Business Applications revenue of $91.8 million, up 37.6% year over year. International revenue of $207.3 million, up 52.9% year over year. GoDaddy's GoCentral is seeing continued strong adoption, increasing conversion from free to paid, and generating positive customer feedback and rising net promoter scores. GoDaddy continues to enhance GoCentral's features, recently launching Online Appointment scheduling, payments via Square, blogging capabilities, and integration with Google My Business, among many other features. GoCentral users can now book client appointments online 24x7, sync with the most popular calendars, get paid easily offline or online, and create powerful online identities via Google. GoDaddy continued its successful integration of HEG, including the recent launch of localized marketing efforts in multiple European markets. GoDaddy announced it will acquire Main Street Hub for approximately $125 million in cash plus up to $50 million in potential future earnouts. Main Street Hub provides small businesses with a complete "do-it-for-me" service for managing engagement on the most popular social networks. The transaction is expected to close late in the second quarter of 2018. GoDaddy appointed Mark Garrett to its board of directors. Mr. Garrett, Executive Vice President and Chief Financial Officer at Adobe, brings deep financial technology leadership to the board. GoDaddy announced it will host an Investor Day on March 28, 2018 at its Global Technology Center in Tempe, Arizona. Given limited space, interested shareholders and analysts are encouraged to email investors@godaddy.com for an invitation. GoDaddy completed a secondary offering of 7.2 million shares of its Class A common stock sold by certain of its stockholders at $47.32 per share in December 2017, increasing the publicly available float. 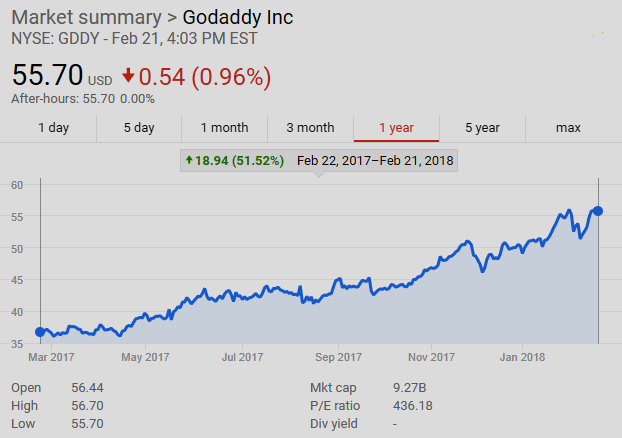 SeekingAlpha.com: GoDaddy Q4 EPS of $0.56 beats by $0.47. Revenue of $602.2M (+23.9% Y/Y) beats by $7.63M. "GoDaddy powers the world's largest cloud platform dedicated to small, independent ventures. With over 17 million customers worldwide and nearly 73 million domain names under management, GoDaddy is the place people come to name their idea, build a professional website, attract customers and manage their work. Our mission is to give our customers the tools, insights and the people to transform their ideas and personal initiative into success."